Shaun Botterill/Getty ImagesAron Gunnarsson of Iceland celebrates his team’s victory over Austria in the UEFA European Championship 2016. Iceland continued its unbelievable performance at its first-ever major soccer tournament, beating Austria on Wednesday with a dramatic stoppage-time goal to secure a spot in the European Championship round of 16. Icelandic soccer announcer Gudmundur Benediktsson was already shrieking as Iceland initiated a three-on-two break with just seconds remaining. Everything’s open! Theódór Elmar! Is he alone on their side of the field? Three on two! Emmi [short for Elmar]! Inside the box! Inside the box! Emmi! YEEEEEES! YEEEEEES! YEEEEEES! YEEEEEES! YEEEEEES! YEEEEEES! We are winning! We have qualified to the 16 team final! We have qualified to the 16 team competition! We are winning Austria! The voice is gone, but that doesn’t matter, we have qualified! Arnór Ingvi Traustason! Just scored! Iceland two, Austria one! What a moment! What a moment! What! The referee has called the game, and I have never, I have never felt this good! Arnór Ingvi Traustason guarantees us the first win in the Euros! We have never lost, don’t forget that, we have never lost but the first win is a fact! Iceland two, Austria one. Thanks for coming Austria, thanks for coming! 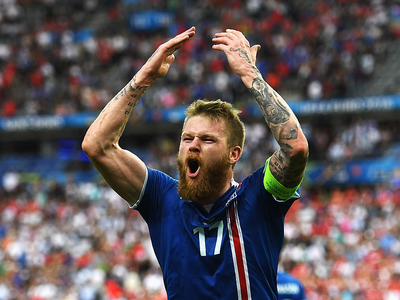 The victory locked Iceland into second place in Group F, with the top two teams in each group advancing. Benediktsson, nicknamed Gummi Ben, has a well-documented history of animated calls. Now that Iceland’s ticket to the round of 16 is booked, we can only hope for more delightful calls from Gummi Ben.